IMS takes no position regarding the validity or scope of any intellectual property or other rights that might be claimed to pertain to the implementation or use of the technology described in this document or the extent to which any license under such rights might or might not be available; neither does it represent that it has made any effort to identify any such rights. Information on IMS’s procedures with respect to rights in IMS specifications can be found at the IMS Intellectual Property Rights web page: /ipr/imsipr_policyFinal.pdf. The Learning Information Services (LIS) specification is the definition of how systems manage the exchange of information that describes people, groups, memberships, courses and outcomes within the context of learning. The LIS v2.0 specification supersedes the IMS GLC Enterprise Services v1.0 specification. The LIS specification is based upon the aggregation of the Person Management, Group Management, Membership Management, Course Management, Outcomes Management and the Bulk Data Exchange Management Services specifications. The LIS v2.0 can be implemented using a Web Services infrastructure (based upon a SOAP/http transport mechanism). An implementation is not required to support each and every service. Neither is an implementation required to support each and every operation. The specific requirements are defined in the corresponding profile. Interoperability is supported between systems that implement the same profile. Cross-profile interoperability may occur but this is a by-product and should NOT be used as the basis for any system realization. One of the outputs of the LIS specification is the set of Web Services Description Language/XML Schema Definition (WSDL/XSD) binding files. Each service has its own set of WSDL/XSD files. It is these files that are used by code-generation tools to create the source code that handles the SOAP messages and XML data structures. Some small changes are required to the WSDL files to map the SOAP messages to the actual server-based implementation of the Web Service. · Core Profile & Conformance Specification – the Core Profile defines the minimal subset of the functionality that must be supported by systems developed for deployment between a Student Information System and a Learning Management System. This Profile (there is a Core plus several Additions) defines the set of operations and data models that must be supported by the systems implementing the set of services within the LIS. A system can support greater functionality but there is no guarantee of interoperability for those extra features. Interoperability is only guaranteed for the functionality described in the Core Profile. Figure 5.1 Schematic representation of the documentation set. Figure A1.1 PersonManagementService interface definition. Figure B1.1 GroupManagementService interface definition. Figure C1.1 MembershipManagementService interface definition. Figure D1.1 CourseManagementService CourseTemplateManager interface definition. Figure D1.2 CourseManagementService CourseOfferingManager interface definition. Figure D1.3 CourseManagementService CourseSectionManager interface definition. Figure D1.4 CourseManagementService SectionAssociationManager interface definition. 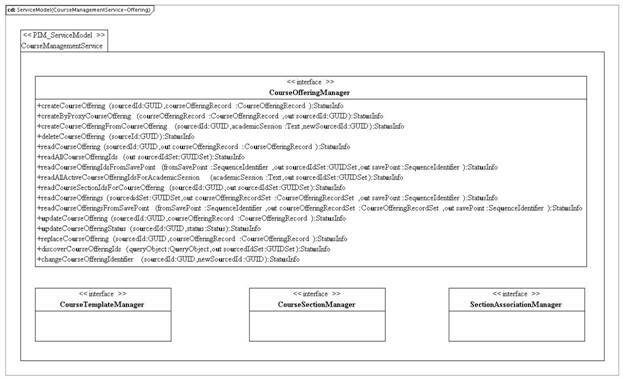 Figure E1.1 OutcomesManagementService LineItemManager interface definitions. 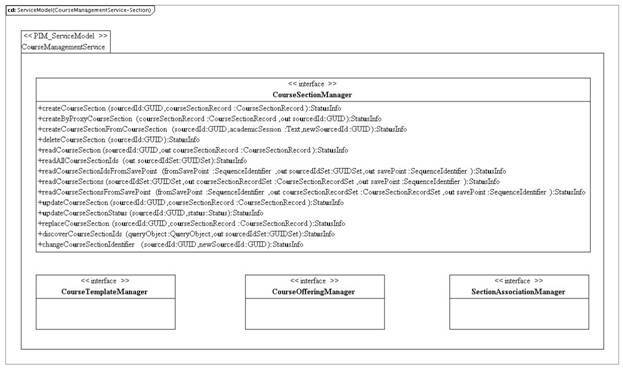 Figure E1.2 OutcomesManagementService ResultManager interface definitions. Figure E1.3 OutcomesManagementService ResultValueManager interface definitions. Figure F1.1 BulkDataExchangeManagementService interface definition. Table 3.1 Version history for Enterprise/LIS specifications. Table A2.1 Summary of operations for PersonManager. Table B2.1 Summary of operations for GroupManager. Table C2.1 Summary of operations for the MMS. Table D2.1 Summary of operations for CourseTemplateManager. Table D2.2 Summary of operations for CourseOfferingManager. Table D2.3 Summary of operations for CourseSectionManager. Table D2.4 Summary of operations for SectionAssociationManager. Table E2.1 Summary of operations for LineItemManager. Table E2.2 Summary of operations for ResultManager. Table E2.3 Summary of operations for ResultValueManager. Table F2.1 Summary of operations for BulkDataExchangeManager. · Adoption – whenever appropriate, the Learning Information Services specification makes use of other IMS GLC and non-IMS GLC standards and specifications. f) IMS GLC Bulk Data Exchange Management Services Information Model v1.0 [BDEMS, 11a]. The Learning Information Services Specification v2.0 can be implemented using both a Web Services infrastructure (based upon a SOAP/http transport mechanism) and the LDAP. 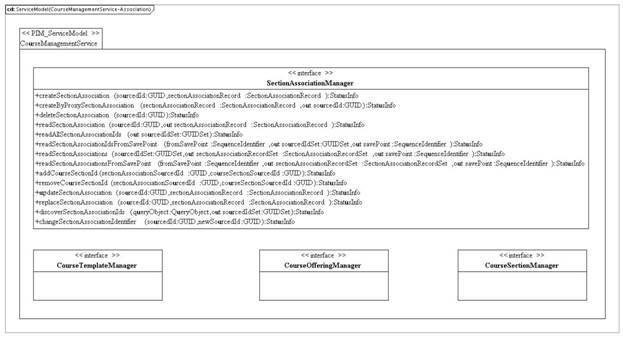 The Web Service bindings are detailed in the corresponding service binding documents [PMS, 11b], [GMS, 11b], [MMS, 11b], [OMS, 11b], [CMS, 11b], [BDEMS, 11b]. An overview of the operations provided in the Bulk Data Exchange Management Service. [BDEMS, 11a] IMS GLC Bulk Data Exchange Management Service Information Model v1.0 Final Release v1.0, L.Feng, W.Lee and C.Smythe, IMS Global Learning Consortium, June 2011. [BDEMS, 11b] IMS GLC Bulk Data Exchange Management Service v1.0 WSDL Binding v1.0 Final Release, L.Feng, W.Lee and C.Smythe, IMS Global Learning Consortium, June 2011. [CMS, 11a] IMS GLC Course Management Service v1.0 Information Model v1.0 Final Release, L.Feng, W.Lee and C.Smythe, IMS Global Learning Consortium, June 2011. [CMS, 11b] IMS GLC Course Management Service v1.0 WSDL Binding v1.0 Final Release, L.Feng, W.Lee and C.Smythe, IMS Global Learning Consortium, June 2011. [ES, 04a] IMS GLC Enterprise Services Specification Final Release v1.0, C.Smythe and C.Vento, IMS Global Learning Consortium, June 2004. [ES, 04b] IMS GLC Enterprise Services Use-cases Final Release v1.0, C.Smythe and C.Vento, IMS Global Learning Consortium, June 2004. [GMS, 04] IMS GLC Group Management Service Information Model v1.0 Final Release, C.Smythe and C.Vento, IMS Global Learning Consortium, June 2004. [GMS, 11a] IMS GLC Group Management Service v2.0 Information Model v1.0 Final Release, L.Feng, W.Lee and C.Smythe, IMS Global Learning Consortium, June 2011. [GMS, 11b] IMS GLC Group Management Service v2.0 WSDL Binding v1.0 Final Release, L.Feng, W.Lee and C.Smythe, IMS Global Learning Consortium, June 2011. [LIS, 11a] IMS GLC Learning Information Services v2.0 Specification Overview Final Release v1.0, L.Feng, W.Lee and C.Smythe, IMS Global Learning Consortium, June 2011. [LIS, 11b] IMS GLC Learning Information Services v2.0 Best Practices & Implementation Guide v1.0 Final Release, L.Feng, W.Lee and C.Smythe, IMS Global Learning Consortium, June 2011. [LIS, 11c] IMS GLC Learning Information Services v2.0: Core Profile v1.0 Final Release, L.Feng, W.Lee and C.Smythe, IMS Global Learning Consortium, June 2011. [MMS, 04] IMS GLC Membership Management Service Information Model v1.0 Final Release, C.Smythe and C.Vento, IMS Global Learning Consortium, June 2004. [MMS, 11a] IMS GLC Membership Management Service v2.0 Information Model v1.0 Final Release, L.Feng, W.Lee and C.Smythe, IMS Global Learning Consortium, June 2011. [MMS, 11b] IMS GLC Membership Management Service v2.0 WSDL Binding v1.0 Final Release, L.Feng, W.Lee and C.Smythe, IMS Global Learning Consortium, June 2011. [OMS, 11a] IMS GLC Outcomes Management Service v1.0 Information Model v1.0 Final Release, L.Feng, W.Lee and C.Smythe, IMS Global Learning Consortium, June 2011. [OMS, 11b] IMS GLC Outcomes Management Service v1.0 WSDL Binding v1.0 Final Release, L.Feng, W.Lee and C.Smythe, IMS Global Learning Consortium, June 2011. [PMS, 11a] IMS GLC Person Management Service v2.0 Information Model v1.0 Final Release, L.Feng, W.Lee and C.Smythe, IMS Global Learning Consortium, June 2011. [PMS, 11b] IMS GLC Person Management Service v2.0 WSDL Binding v1.0 Final Release, L.Feng, W.Lee and C.Smythe, IMS Global Learning Consortium, June 2011. [SAN11, 06] IMS GLC Profile Definition, Registration and Maintenance Procedures, SAN-11, C.Smythe, IMS Global Learning Consortium, November 2006. [SDN07, 06] IMS GLCUML Profile for Platform Independent Model Descriptions of Specifications, SDN-07, C.Smythe, IMS Global Learning Consortium, October 2006. [SDN08, 06] IMS GLCUML Profile for Platform Specific Model Descriptions of Specification Bindings, SDN-08, C.Smythe, IMS Global Learning Consortium, October 2006. [SDN11, 06] IMS GLC Vocabulary Definitions, Registration and Maintenance Procedures, SDN-11, C.Smythe, IMS Global Learning Consortium, July 2006. · Batch processing – to provide initialization and synchronization transfer of very large amounts of data. · Get All Enrollment Information for All Persons. · Use Differing Kinds of Learning Context for Differing Administrative Contexts. · Search for a Course Template or Offering. · Get the Final Grade for All Active Course Offerings for a Given Person. · Batch Initialization of everything. Six services are defined. Instances of the data models are stored in the service consumer/provider object repositories. It is the persistence of the data in these repositories that reflects the dynamic changes in the system. The set of services are realized as SOAP messages to exchange the XML-based data object. One of the outputs of the LIS specification is the set of WSDL/XSD binding files. Each service has its own set of WSDL/XSD files. It is these files that are used by code-generation tools to create the source code that handles the SOAP messages and XML data structures. Some small changes are required to the WSDL files to map the SOAP messages to the actual server-based implementation of the Web Service. These changes can either be manually applied to the WSDL files or to the UML files. The UML files must then be processed using the IMS GLC Binding Auto-generation Tool-kit (I-BAT) to create the new, tailored WSDL/XSD files. The release history for the LIS is listed in Table 3.1. The original Enterprise v1.0 data model was the second specification released by IMS GLC. It has undergone several revisions in response to feedback from the experience gained in the various implementations. Introduction of services, based upon the IMS GLC General Web Services, to support the exchange of the information based upon the Enterprise v1.1 data model. LIS v2.0 is a radical reworking of both the original services and data models. d) The core data model has been extended to support both the PMSv1.0 and the IMS GLC Learner Information Packaging (LIP) v1.0 ‘identification’ data models. The data model has also been modified to use external vocabularies. d) Version 1.0 implementations of the Group Management Service were used to exchange information about courses. For Version 2 this is only permitted for additional features that are added to the Course Management Service capabilities (see [CMS, 11a] for more details). A Group cannot have a membership of a Group. Therefore, the ‘memberIdType’ attribute has been removed because it is now unnecessary i.e., only a Person object can be a member of a Group, etc. The Course Management Service was not part of the IMS GLC Enterprise Services v1.0 specification [ES, 04a]. Instead, this functionality was supported using the IMS GLC Group Management Service v1.0 [GMS, 04] specification in a variety of different ways. This created interoperability problems hence the creation of the CMS specification. The Course Management Service v1.0 is closely linked to the Group Management Service v2.0 and Membership Management Service (MMS) v2.0. The MMS is used to define the participants in a Course defined by the CMS and Courses are extended using the GMS. Therefore the GMS and MMS must be implemented to obtain the full functionality of the CMS. The Outcomes Management Service was not developed in the IMS GLC Enterprise Services v1.0 specification [ES, 04a]. Instead, a simplified form of functionality was supported using the IMS GLC Membership Management Services (MMS) v1.0 [MMS, 04]. In general, there is NO backwards compatibility between the usage of the OMSv1.0 and the ways in which MMSv1.0 has been implemented to support outcomes management. Vendors may define compatibility bridges for their own implementations but these are outside the scope of this specification. The Bulk Data Exchange Management Service was not developed in the IMS GLC Enterprise Services v1.0 specification [ES, 04a]. Instead a series of best practices were defined to achieve data synchronization and initialization. These are now replaced by the use of the BDEMS. · It is important to note that the use of the LIS specification does not provide ‘out-of-the-box’ interoperability. This is not a failure of the specification but a reflection of the pragmatic nature of agreeing such a specification and enabling commercial competitiveness. Many system architecture aspects are not addressed by the specification e.g., service link initialization by which two end systems become aware of the capabilities supported by the other, service integrity and security, etc. This type of information is exchanged using either an out-of-band set of services or as part of service deployment and configuration. The Core Profiles identify the minimal subset of the functionality that must be supported by systems developed for Student Information System/Learning Management System (SIS/LMS) deployment. These Profiles (there is a Core plus several Additions) define the set of operations and data models that must be supported by the systems supporting the set of services within the LIS. A system can support greater functionality but there is no guarantee of interoperability for those extra features. Interoperability is only guaranteed for the functionality described in the Core Profiles. · The announceBulkDataExchange, reportBulkDataExchange, ignoreBulkDataExchange and SOAP-based file download operations for the Bulk Data Exchange Management Service. · Full Course Hierarchy – provides support for the management of the full course structure (templates, offerings, sections and section associations) using the Course Management Service. · For each data model identify any increased constraints on the multiplicity of any attributes i.e., optional can become mandatory, optional can be prohibited and many can be reduced to one. It is recommended that the profile be documented using the original Unified Modeling Language (UML) Platform Independent Model (PIM)/Platform Specific Model (PSM) descriptions. Each change should have a documented comment. Once the Profile has been completed, the I-BAT should be used to generate the new WSDL/XSD from the profiled UML PSM. Conformance to LIS is non-trivial even when this is against a Profile. An inclusive approach to conformance has been adopted. The conformance statement for a profile is described as the set of business capabilities that are supported by the Profile e.g., student enrolment in a course, reporting of a student result, etc. An implementation claiming conformance must identify which of the capabilities are supported; this takes the form of a checklist. Therefore, interoperability between two systems is determined by the extent of the overlap in the corresponding checklists. As an aid to implementers, once the business capability checklist has been produced a corresponding functional map is produced. This functional map identifies the set of services, operations and data model features that must be supported to realize the business capability. Any list of business capabilities will require a common set of LIS functional capabilities (the extent defines how much of the LIS is required to support a Profile). This list of functionality defines how a business capability MUST be realized using the LIS specification. This approach has been used to allow incremental adoption of the LIS specification. Therefore, there are degrees of interoperability and it becomes the responsibility of developers to clearly identify which features of the LIS specification are implemented. Over time, the degree of interoperability across the community should increase. This document. It describes how the LIS is composed using its six component services. There is an overview version of this document [LIS, 11a]. A schematic representation of the document set is shown in Figure 5.1. The Information Model documents contain the normative description of the various service definitions, data structures and their relationships. These descriptions use the UML, and in particular, the IMS GLC UML Profile Platform Independent Model (PIM) Description for Specifications [SDN07, 06]. Each of the six services has its own Information Model [PMS, 11a], [GMS, 11a], [MMS, 11a], [CMS, 11a], [OMS, 11a] and [BDEMS, 11a]. The WSDL Binding documents contain the PSM for the service. This PSM has been transformed into the corresponding Web Services Description Language (WSDL) and XML Schema Definition (XSD) files using the I-BAT. 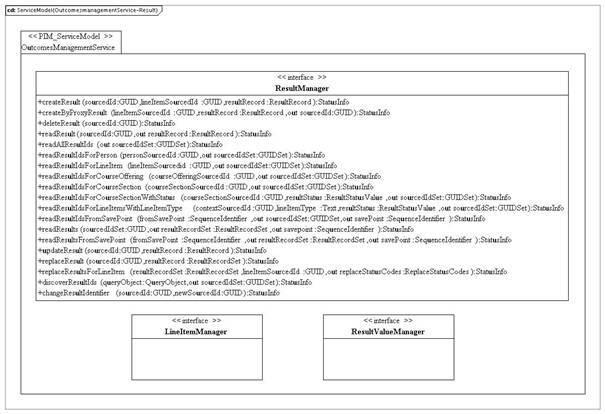 The Binding document describes the underlying structure of the WSDL/XSD, the associated Vocabulary Definition Exchange (VDEX) vocabulary files and the formats of the corresponding SOAP messages. The IMS GLC LIS Best Practice and Implementation Guide [LIS, 11b] is intended to provide vendors with an overall understanding of the IMS GLC LIS Specification, the relationship of the specification with other IMS GLC specifications, and a best practices guide derived from experiences of those using the specification. The guide also includes a several actual examples that describe how vendors can make the best use of the IMS LIS Specification. Core Profiles for the LIS have been created [LIS, 11c]. The Core Profiles identifies the minimal subset of the functionality that must be supported by systems developed for SIS/LMS interaction. This Profile (there is a Core plus several Additions) defines the set of operations and data models that must be supported by the systems implementing the set of services within the LIS. A system can support greater functionality but there is no guarantee of interoperability for those extra features. Interoperability is only guaranteed for the functionality described in the HE Profiles. For the Core and the set of Additions there is a set of conformance statements. These statements constitute the Conformance Specification for each profile. · IMS GLC SDN 11: Vocabulary Definition, Registration and Maintenance Procedures [SDN11, 06] – provides the definition and description of how the set of external attribute vocabularies are expressed as instances of the IMS Vocabulary Definition Exchange (VDEX) specification [VDEX, 04]. Each of the services has a WSDL file that describes the nature of the service. Each service has a single combined WSDL/XSD file. Separate WSDL and XSD files are also available. Apart from the separate XSD file that complements the corresponding separate WSDL file, there are other XSD files. These files are used to validate the content of external data files that are exchanged in the BDEMS using an appropriate file transfer protocol. Each of the services has a set of VDEX files that contain the set of default vocabularies defined in the Information Model. The VDEX files conform to the IMS GLC VDEX specification [VDEX, 04]. 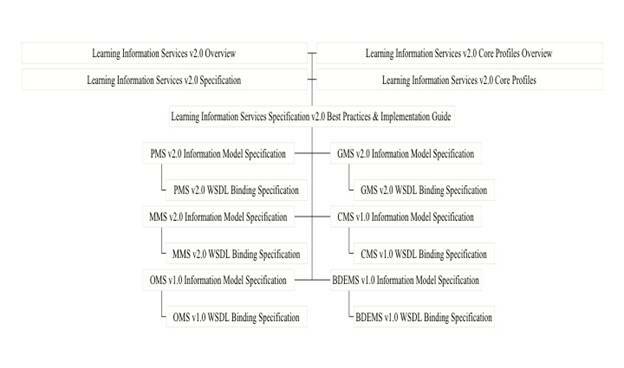 The documentation set of the IMS GLC Learning Information Services Specification is daunting. However, a few simple guidelines make it considerably easier for even a newcomer to work through the documents. The IMS GLC LIS Core Profiles [LIS, 11c] should be used as the basis for providing the core service capability. This profile identifies the minimal set of service operations that are required to create a ‘useful’ learning information service (the profile identified less than 5% of the full set of service operations as necessary). The Person Management Service is used to model the service responsible for manipulating information about people. The PersonManagementService interface is shown in Figure A1.1. 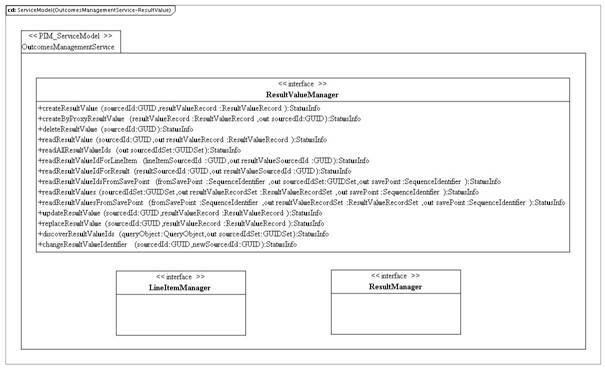 The PersonManager interface class describes the operations that are permitted on Person objects. These operations are based upon the classic Create/Read/Update/Delete model with variations defined to differentiate subtleties of functionality. The interface stereotype indicates that there are no attributes for this class. The set of operations are summarized in Table A2.1. To request the creation of a populated Person object on the target system where the source is responsible for the allocation of the unique identifier. To request the creation of a populated Person object on the target system where the target is responsible for the allocation of the unique identifier. To request the deletion of a Person object. The Person object is deleted and all of its associated Memberships. To read the full contents of the identified Person object. The target must return all of the data it has for the identified Person object. To read the minimal mandatory contents of the identified Person object. Only the data structures that form the core of a Person object must be returned. To obtain the set of identifiers which have been assigned to Person objects. To obtain the set of identifiers for Person objects which have been altered since the requested reference point. The reference point is set as ‘zero’ at creation and incremented after every write operation. To obtain the Person objects for a defined set of identifiers. This results in a single transaction that may require the exchange of a large volume of data in the response message. To obtain the set of Person objects which have been altered since the requested reference point. The reference point is set as ‘zero’ at creation and incremented after every write operation. This results in a single transaction that may require the exchange of a large volume of data in the response message. To write new content into the identified Person object. The target must write the new data into the Person object. This is an additive operation. To replace the content of the identified Person object. The target must write the new data into the Person object. This is a destructive write-over of all of the original information. If the Person object does not exist, this operation acts as per a ‘createPerson’ request. To obtain the set of identifiers for Person objects whose properties agree with those defined in the query. To change the SourcedId of the Person object. The completion of this operation will result in later actions using the original SourcedId reporting an unknown identifier status. The Group Management Service is used to model the service responsible for manipulating information about Groups. The GroupManagementService is shown in Figure B1.1. The GroupManager interface class describes the operations that are permitted on Group objects. These operations are based upon the classic Create/Read/Update/Delete model with variations defined to differentiate subtleties of functionality. The interface stereotype indicates that there are no attributes for this class. The set of operations are summarized in Table B2.1. To replace the content of the identified Group object. The target must write the new data into the Group object. This is a destructive write-over of all of the original information. If the Group object does not exist, this operation acts as per a ‘createGroup’ request. The Membership Management Service is used to model the service responsible for manipulating information about people’s memberships of Groups [GMS, 11a] and Courses [CMS, 11a]. The MembershipManagementService is shown in Figure C1.1. The MembershipManager interface class describes the operations that are permitted on Membership objects. These operations are based upon the classic Create/Read/Update/Delete model with variations defined to differentiate subtleties of functionality. The interface stereotype indicates that there are no attributes for this class. The set of operations are summarized in Table C2.1. To request the creation of a populated Membership object on the target system where the source is responsible for the allocation of the unique identifier. To request the creation of a populated Membership object on the target system where the target is responsible for the allocation of the unique identifier. To request the deletion of a Membership object. 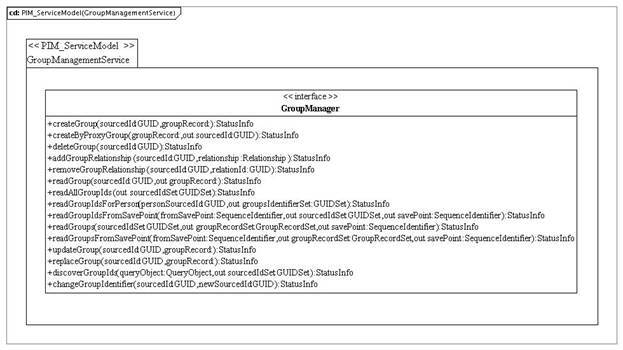 The Membership object is deleted along with all of its associated relationships (the associated Group, Course and Person objects are not deleted). To read the full contents of the identified Membership object. The target must return all of the data it has for the identified Membership object. To obtain the set of identifiers for all of the Membership objects for the identified Person object. To obtain the set of identifiers for all of the Membership objects for the identified Person object with a specific Member Role. To obtain the set of identifiers for all of the Membership objects for the identified collection object i.e., Group, CourseTemplate, CourseOffering, CourseSection or SectionAssociation. To obtain the set of identifiers which have been assigned to Membership objects. To obtain the set of identifiers for Membership objects which have been altered since the requested reference point. The reference point is set as ‘zero’ at creation and incremented after every write operation. To obtain the Membership objects for a defined set of identifiers. This results in a single transaction that may require the exchange of a large volume of data in the response message. To obtain the set of Membership objects which have been altered since the requested reference point. The reference point is set as ‘zero’ at creation and incremented after every write operation. This results in a single transaction that may require the exchange of a large volume of data in the response message. To write new content into the identified Membership object. The target must write the new data into the Membership object. This is an additive operation. To replace the content of the identified Membership object. The target must write the new data into the Membership object. This is a destructive write-over of all of the original information. If the Membership object does not exist, this operation acts as per a ‘createMembership’ request. To obtain the set of identifiers for Membership objects whose properties agree with those defined in the query. To change the SourcedId of the Membership record. The completion of this operation will result in subsequent actions using the original SourcedId reporting an unknown identifier status. The Course Management Service is used to model the service responsible for manipulating information about course structures. The CourseManagementService interfaces are shown in Figures D1.1, D1.2, D1.3 and D1.4. The Course Management Service is defined by four interfaces: CourseTemplateManager that supports the manipulation of CourseTemplates; CourseOfferingManager that supports the manipulation of CourseOfferings; CourseSectionManager that supports the manipulation of CourseSections; and SectionAssociation Manager that supports the manipulation of SectionAssociations. 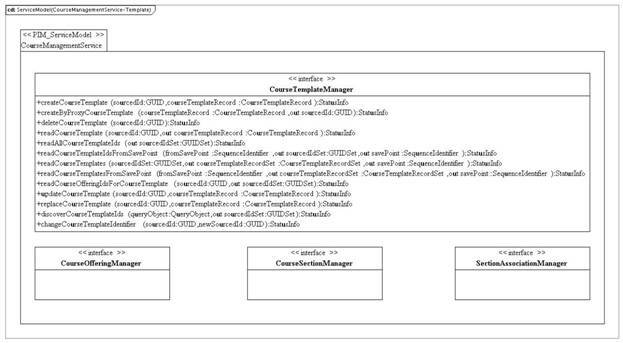 The CourseTemplateManager interface class describes the operations on a CourseTemplate. The interface stereotype indicates that there are no attributes for this class. The set of operations are summarized in Table D2.1. To request the creation of a populated CourseTemplate object on the target system where the source assigns the unique identifier. 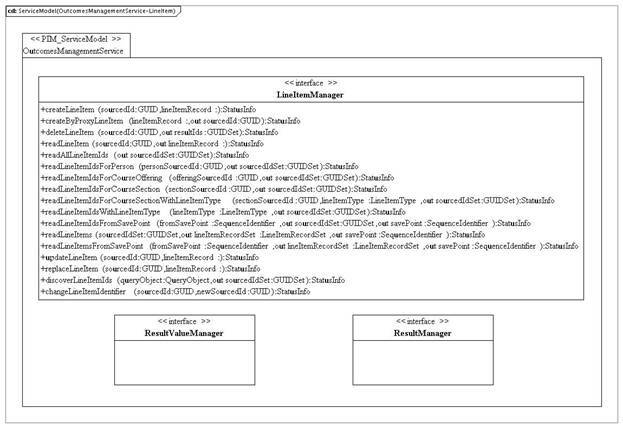 To request the creation of a populated CourseTemplate object on the target system where the target assigns the unique identifier. To request the deletion of a CourseTemplate object. The CourseTemplate object is deleted and all of its associated relationships. To read the full contents of the identified CourseTemplate object. The target must return all of the data it has for the CourseTemplate object. To obtain the set of SourcedIds which have been assigned to CourseTemplate objects. To obtain the set of SourcedIds of the CourseOfferings associated with the CourseTemplate. To obtain the set of SourcedIds for CourseTemplates objects which have been altered since the requested reference point. The reference point is set as zero at creation and incremented after every write operation. To get the CourseTemplate objects for a defined set of SourcedIds. This results in a single transaction that may require the exchange of a large volume of data in the response message. To obtain the set of CourseTemplate objects which have been altered since the requested reference point. The reference point is set as ‘zero’ at creation and incremented after every write operation. This results in a single transaction that may require the exchange of a large volume of data in the response message. To write new content into the identified CourseTemplate object. The target must write the new data into the CourseTemplate object. This is an additive operation. To replace the content of the identified CourseTemplate object. The target must write the new data into the CourseTemplate object. This is a destructive write-over of all of the original information. If the CourseTemplate object does not exist, this operation acts as per a ‘createCourseTemplate’ request. To obtain the set of SourcedIds for CourseTemplate objects whose properties agree with those defined in the query. To change the SourcedId of the CourseTemplate record. The completion of this operation will result in later actions using the original SourcedId reporting an unknown identifier status. The CourseOfferingManager interface class describes the operations that are permitted on a CourseOffering. The interface stereotype indicates that there are no attributes for this class. The set of operations are summarized in Table D2.2. To request the creation of a populated CourseOffering object on the target system where the source is responsible for the allocation of the unique identifier. To request the creation of a populated CourseOffering object on the target system where the target is responsible for the allocation of the unique identifier. To create a new CourseOffering from the supplied CourseOffering for a particular academic session. To request the deletion of a CourseOffering object. The CourseOffering object is deleted and all of its associated relationships. To read the full contents of the identified CourseOffering object. The target must return all of the data it has for the identified CourseOffering object. To obtain the set of SourcedIds which have been assigned to CourseOffering objects. To obtain the set of SourcedIds for all of the active CourseOfferings for the identified academic session. To obtain the set of SourcedIds of the CourseSections associated with the CourseOffering. To obtain the set of SourcedIds for CourseOfferings objects which have been altered since the requested reference point. The reference point is set as ‘zero’ at creation and incremented after every write operation. To obtain the CourseOffering objects for a defined set of identifiers. This results in a single transaction that may require the exchange of a large volume of data in the response message. To obtain the set of CourseOffering objects which have been altered since the requested reference point. The reference point is set as ‘zero’ at creation and incremented after every write operation. This results in a single transaction that may require the exchange of a large volume of data in the response message. To replace the content of the identified CourseOffering object. The target must write the new data into the CourseOffering object. This is a destructive write-over of all of the original information. If the CourseOffering object does not exist, this operation acts as per a ‘createCourseOffering’ request. To write new content into the identified CourseOffering object. The target must write the new data into the CourseOffering object. This is an additive operation. To change the status of the identified CourseOffering to the supplied value. To obtain the set of SourcedIds for CourseOffering objects whose properties agree with those defined in the query. To change the SourcedId of the CourseOffering record. The completion of this operation will result in later actions using the original SourcedId reporting an unknown identifier status. The CourseSectionManager interface class describes the operations that are permitted on a CourseSection. The interface stereotype indicates that there are no attributes for this class. The set of operations are summarized in Table D2.3. To request the creation of a populated CourseSection object on the target system where the source is responsible for the allocation of the unique identifier. To request the creation of a populated CourseSection object on the target system where the target is responsible for the allocation of the unique identifier. To create a new CourseSection from the supplied CourseSection for a particular academic session. To request the deletion of a CourseSection object. The CourseSection object is deleted along with all of its associated Memberships. To read the full contents of the identified CourseSection object. The target must return all of the data for the identified CourseSection object. To obtain the set of sourcedIds which have been assigned to CourseSection objects. To obtain the set of sourcedIds for CourseSection objects which have been altered since the supplied reference point. The reference point is set as ‘zero’ at creation and incremented after every write operation. To obtain the CourseSection objects for a defined set of identifiers. This results in a single transaction that may require the exchange of a large volume of data in the response message. To obtain the set of CourseSection objects which have been altered since the requested reference point. The reference point is set as ‘zero’ at creation and incremented after every write operation. This results in a single transaction that may require the exchange of a large volume of data in the response message. To replace the content of the identified CourseSection object. The target must write the new data into the CourseSection object. This is a destructive write-over of all of the original information. If the CourseSection object does not exist, this operation acts as per a ‘createCourseSection’ request. To write new content into the identified CourseSection object. The target must write the new data into the CourseSection object. This is an additive operation. To change the status of the identified CourseSection. To obtain the set of SourcedIds for CourseSection objects whose properties agree with those defined in the query. To change the SourcedId of the CourseSection record. The completion of this operation will result in later actions using the original SourcedId reporting an unknown identifier status. The SectionAssociationManager interface class describes the operations that are permitted on a SectionAssociation. The interface stereotype indicates that there are no attributes. The operations are summarized in Table D2.4. To request the creation of a populated SectionsAssociation object on the target system where the source is responsible for the allocation of the unique identifier. To request the creation of a populated SectionsAssociation object on the target system where the target is responsible for the allocation of the unique identifier. To request the deletion of a SectionAssociation object. The SectionAssociation object is deleted and all associated relationships. To read the full contents of the identified SectionAssociation object. The target must return all of the data it has for the identified SectionAssociation object. To obtain the set of SourcedIds which have been assigned to SectionAssociation objects. To obtain the set of SourcedIds for SectionAssociations objects which have been altered since the requested reference point. The reference point is set as ‘zero’ at creation and incremented after every write operation. To obtain the SectionAssociation objects for a defined set of identifiers. This results in a single transaction that may require the exchange of a large volume of data in the response message. To obtain the set of SectionAssociation objects which have been altered since the requested reference point. The reference point is set as ‘zero’ at creation and incremented after every write operation. This results in a single transaction that may require the exchange of a large volume of data in the response message. To add a new Course Section identifier to the SectionAssociation. To remove a Course Section identifier from the SectionAssociation. To replace the content of the identified SectionAssociation object. The target must write the new data into the SectionAssociation object. This is a destructive write-over of the original information. If the SectionAssociation object does not exist, this operation acts as per a ‘create SectionAssociation’ request. To write new content into the identified SectionAssociation object. The target must write the new data into the SectionAssociation object. This is an additive operation. To obtain the set of sourcedIds for SectionAssociation objects whose properties agree with those defined in the query. To change the sourcedId of the SectionAssociation record. The completion of this operation will result in later actions using the original sourcedId reporting an unknown identifier status. The Outcomes Management Service is used to model the service responsible for manipulating information about outcomes. The Outcomes Management Service interfaces are shown in Figures E.1, E.2 and E.3. The Outcomes Management Service is split into three interfaces: LineItemManager that supports the manipulation of LineItem objects; ResultManager that supports the manipulation of Result objects; ResultValueManager that supports the manipulation of ResultValue objects. The LineItemManager interface class describes the operations that are permitted on LineItems object (as shown in Figure E1.1). The set of operations are summarized in Table E2.1. To request the creation of a populated LineItem object on the target system where the source is responsible for the allocation of the unique SourcedId. To request the creation of a populated LineItem object on the target system where the target is responsible for the allocation of the unique SourcedId. To request the deletion of a LineItem object. The LineItem object is deleted with all of its associated relationships. To read the full contents of the identified LineItem object. The target must return all of the data it has for the identified LineItem object. To obtain all the SourcedIds assigned to LineItem objects. To obtain the set of SourcedIds for the LineItem objects which have a particular state. To obtain the set of SourcedIds for the LineItem objects which are associated with a particular Person object. To obtain the set of SourcedIds for the LineItem objects which are associated with a particular CourseOffering object. To obtain the set of SourcedIds for the LineItem objects which are associated with a particular CourseSection object. To obtain the set of SourcedIds for the LineItem objects with the required state, which are associated with a particular CourseSection object. To obtain the set of SourcedIds for LineItem objects which have been altered since the requested reference point. The reference point is set as ‘zero’ at creation and incremented after every write operation. To obtain the LineItem objects for a defined set of SourcedIds. This results in a single transaction that may require the exchange of a large volume of data in the response message. To obtain the set of LineItem objects which have been altered since the requested reference point. The reference point is set as ‘zero’ at creation and incremented after every write operation. This results in a single transaction that may exchange a large volume of data in the response. To write new content into the identified LineItem object. The target must write the new data into the LineItem object. This is an additive operation. To replace the content of the identified LineItem object. The target must write the new data into the LineItem object. This is a destructive write-over of all of the original information. In the case of the object not existing, this operation acts as an implied ‘createLineItem’. To obtain the set of SourcedIds for LineItem objects whose properties agree with those defined in the query/filter. To change the SourcedId for a LineItem object. The ResultManager interface class describes the operations that are permitted on Result objects (as shown Figure E1.2). The set of operations are summarized in Table E2.2. To request the creation of a populated Result object on the target system where the source allocates the unique SourcedId. The Result object is tied to a LineItem object. To request the creation of a populated Result object on the target system where the target allocates the unique SourcedId. The Result object is tied to a LineItem object. To request the deletion of a Result object. The Result object is deleted but the associated ResultValue and LineItems remain. To read the full contents of the identified Result object. The target must return all of the data it has for the identified Result object. To obtain the set of SourcedIds assigned to Result objects. To obtain the set of SourcedIds for the Result objects which are associated with a particular Person object. To obtain the set of SourcedIds for the Result objects which are associated with a particular LineItem object. To obtain the set of SourcedIds for the Result objects which are associated with a particular CourseOffering object. To obtain the set of SourcedIds for the Result objects which are associated with a particular CourseSection object. To obtain the set of SourcedIds for the Result objects that are associated with a particular CourseSection object and have results of a particular status. To obtain the SourcedIds for the Result objects that are associated with a LineItem that has a particular LineItemType state. To obtain the set of identifiers for Result objects which have been altered since the requested reference point. The reference point is set as ‘zero’ at creation and incremented after every write operation. To obtain the Result objects for a defined set of identifiers. This results in a single transaction that may exchange of a large volume of data. To obtain the set of Result objects which have been altered since the requested reference point. The reference point is set as ‘zero’ at creation and incremented after every write operation. This results in a single transaction that may require the exchange of a large volume of data in the response message. To add content to the identified Result object. The target must write the new data into the Result object. This is an additive operation. To replace the content of the identified Result object. The target must write the new data into the Result object. This is a destructive write-over of all of the original information. In the case of the object not existing, this operation acts as an implied ‘createResult’. To replace the content of the identified Result objects for a given result status for the specified LineItem. The target must write the new data into the Result object. This is a destructive write-over of all of the original information. To obtain the set of SourcedIds for Result objects whose properties agree with those defined in the query/filter. To change the SourcedId of a Result object. The ResultValueManager interface class describes the operations that are permitted on ResultValue objects (as shown Figure E1.3). The set of operations are summarized in Table E2.3. To request the creation of a populated ResultValue object on the target system. The source is responsible for the allocation of the unique SourcedId. To request the creation of a populated ResultValue object on the target system. The target is responsible for the allocation of the unique SourcedId. To request the deletion of a ResultValue object. The ResultValue object is deleted along with all of its associated relationships. To read the full contents of the identified ResultValue object. The target must return all of the data it has for the identified ResultValue object. To obtain the set of SourcedIds that have been assigned to ResultValue objects. To obtain the SourcedId for the ResultValue object which has been associated with a particular LineItem object. To obtain the SourcedId for the ResultValue object which is associated with a particular Result object. To obtain the set of identifiers for ResultValue objects which have been altered since the requested reference point. The reference point is set as ‘zero’ at creation and incremented after every write operation. To obtain the ResultValue objects for a defined set of identifiers. This results in a single transaction that may require the exchange of a large volume of data in the response message. To obtain the set of ResultValue objects which have been altered since the requested reference point. The reference point is set as ‘zero’ at creation and incremented after every write operation. This results in a single transaction that may exchange of a large volume of data in the response message. To write new content into the identified ResultValue object. The target must write the new data into the ResultValue object. This is an additive operation. To replace the content of the identified ResultValue object. The target must write the new data into the ResultValue object. This is a destructive write-over of all of the original information. In the case of the object not existing, this operation acts as an implied ‘createResultValue’. To obtain the set of SourcedIds for ResultValue objects whose properties agree with those defined in the query/filter. To change the SourcedId for a ResultValue object. The Bulk Data Exchange Management Service is used to model the service responsible for manipulating information used in Learning Information Services systems. The BulkDataExchangeManagementService interface is shown in Figure F1.1. The BulkDataExchangeManager interface class describes the operations that are permitted on ‘bulk data’ objects. The interface stereotype indicates that there are no attributes for this class. The set of operations are summarized in Table F2.1. To inform the service consumer that a previously issued, and acknowledged, requestBulkDataExchange transaction cannot be serviced by the service provider. To report the retrieval of the bulk data object whose availability was announced previously. This signals real-time event processing should be restarted. Issued by the service consumer to request a bulk data exchange from the service provider. Issued by the service consumer to inform the service provider that a previously issued announce bulk data exchange request will be ignored. Real-time processing should be resumed by both consumer and server. Issued by the service consumer to inform the service provider that a previously requested bulk data exchange request has now been cancelled. Real-time processing should be resumed by both consumer and server. NOTE: The operation used to download the data file(s) is not defined in Table F2.1. Instead, the specific Web Service binding is recommended in [BDEMS, 11]. Summary: This document contains the description of the IMS GLC Learning Information Services (LIS) specification. LIS is a collection of six component services that are combined to provide the required functionality. These component services are: Person Management Service; Group Management Service; Membership Management Service; Course Management Service; Outcomes Management Service; and Bulk Data Exchange Management Service. As part of the specification a Core Profile has been created for Learning Management System/Student Information System interaction. IMS GLC has created one such profile called the ‘Core Profiles’ [LIS, 10c]. We recommend that new users of the IMS GLC LIS Specification start with the IMS GLC LIS Best Practices & Implementation Guide. The examples in this document show how we intend the specification to be used, whereas the Information Model and WSDL Binding documents contain the formal description of the services, data structures, their syntax and semantics.